DALLAS – March 21, 2018 – Less nutritious dietary choices made by South Asians living in developed countries like the U.S. are a key contributor to the group's rising rate of Type 2 diabetes, UT Southwestern researchers report. More than 4 million South Asians – defined as those from India, Pakistan, Bangladesh, Nepal, and Sri Lanka – live in the United States. In South Asians, the prevalence of Type 2 diabetes is four times that typically found in Caucasians, whose rates are 8.1 percent for men and 6.8 percent for women. Type 2 diabetes also occurs in South Asian Americans at an earlier age and at a lower body mass index (BMI, an index of obesity) than whites, according to the latest statistics from the Centers for Disease Control and Prevention. The new UT Southwestern study showed that U.S. South Asians with Type 2 diabetes consumed fewer calories but also consumed less beneficial nutrients than healthy South Asians. 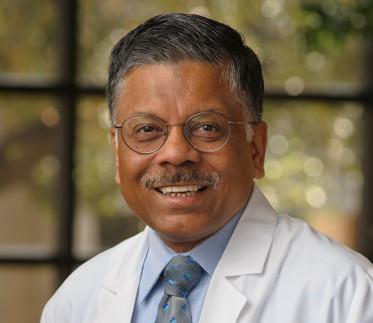 "This is the first study that thoroughly compared both the macronutrient and micronutrient intakes in South Asians with and without Type 2 diabetes using an objective measure – a three-day dietary assessment method that included images of all foods consumed," said Dr. Abhimanyu Garg, Professor of Internal Medicine and senior author of the study in Diabetes Research and Clinical Practice. UT Southwestern's Center for Human Nutrition team recruited 77 U.S. South Asians for the investigation – 44 with diabetes and 33 without. The study found that those with Type 2 diabetes consumed less of these beneficial nutrients: dietary fiber, linoleic acid, vitamin A, vitamin E, calcium, magnesium, zinc, potassium, and β-carotene. "These results clearly indicate that diabetic South Asians may need to improve their dietary habits to achieve nutrient intakes recommended by the Institute of Medicine," said Dr. Garg, Chief of Internal Medicine's Division of Nutrition and Metabolic Diseases and a senior member of the Center for Human Nutrition. "We recommend that South Asians with Type 2 diabetes include in their diets more yellow and orange fruit and vegetables, dark green leafy vegetables, whole grains, legumes, nuts, seeds, vegetable oils, fatty fish, and low-fat milk and dairy products. These recommendations may also be helpful to improve their blood cholesterol and blood pressure levels." This study's findings may be applicable to South Asians living in other developed countries, such as the United Kingdom, Europe, and Singapore, the scientists said. "Our findings may be less applicable to South Asians living in their native countries because of the effect of acculturation [assimilation] on dietary intake in South Asian migrants in the U.S. and because of the economic disparity and its effect on food choices between the two populations," said Dr. Meena Shah, Assistant Professor of Internal Medicine and the lead author of the study. Beverley Adams Huet, Assistant Professor of Clinical Sciences and Internal Medicine, and Dr. Chandna Vasandani, Research Study Coordinator in the Center for Human Nutrition, contributed to the paper with Drs. Shah and Garg. The study builds on earlier diabetes work by Dr. Garg, who joined the UT Southwestern community in 1985. Those findings include demonstrating the beneficial effects of monounsaturated fats and dietary fiber for control of high blood glucose and cholesterol levels in patients with Type 2 diabetes. Dr. Garg's research also focuses on insulin resistance and adipose tissue disorders, called lipodystrophies. Future studies will compare and contrast the diets of healthy U.S.-based South Asians with those who have undiagnosed Type 2 diabetes or prediabetes. "This study reveals the effects of diet in these patients and how they can improve their diet to have better health outcomes," said Dr. Garg, who holds the Distinguished Chair in Human Nutrition Research. "But we also need to assess blood nutrient levels, daily energy expenditures, stress levels, and other lifestyle behaviors in order to do a comprehensive assessment of the factors that contribute to prediabetes or Type 2 diabetes among South Asians." The work was partly supported by the Gupta Agarwal Charitable Foundation, the Jiv Daya Foundation, and Southwestern Medical Foundation.